General Mariano Guadalupe Vallejo was an extraordinary Californio. He founded Sonoma and is remembered today as a great American who contributed a great deal to California both before and after statehood. His life is essentially the history of 19th century Sonoma and his influence is still evident in 21st century Sonoma. EARLY LIFE: Mariano Guadalupe Vallejo was born in Monterey on July 4, 1807. His parents were Ignacio Vallejo and Maria Lugo Vallejo. He was tutored by William Hartnell, a respected English-born resident of the area. When still a boy he witnessed the occupation and looting of Monterey by the Argentinean pirate, Hippolyte Bouchard. At the age of 15 he became the personal secretary to Governor Arguello. This same year (1821) Mexico became independent of Spain. In early 1824, Mariano Vallejo enrolled in the military service of Monterey as a cadet. He rose rapidly through the ranks and as a second lieutenant in 1829, he commanded an army that battled a large band of rebellious Miwok Indians east of Monterey. In 1830, he became military commandant of the San Francisco Presidio. Two years later, he married the 17 year old Francisca Benicia Carrillo while on a visit to San Diego. COMMANDANT GENERAL OF NORTHERN CALIFORNIA: Under the new Governor José Figueroa, Vallejo was sent north in 1833 to visit Fort Ross, and find a suitable location for a presidio north of the Bay of San Francisco. Vallejo was authorized to establish a military post at Sonoma at the site of the ten year old Mission San Francisco de Solano. That same year, Vallejo was granted a ten-league grant, the Rancho Petaluma east of the mission. Vallejo was subsequently appointed administrator of the secularization of the Mission at Sonoma, Director of Colonization of the Northern Frontier, and military commandant of all of California north of the Bay. Lieutenant Vallejo received an order, dated June 24, 1835, from Governor Figueroa to establish the Pueblo de Sonoma. He soon laid out the main streets of Sonoma and set about building a barracks building to the west of the mission, as well as a large dwelling, Casa Grande, for his growing family which would include 10 children. Following the successful rebellion of his nephew, Juan Alvarado, against an unpopular Governor Gutierrez in 1836, the new Monterey government promoted Mariano Vallejo to colonel of cavalry, Commandant General, and military governor of the “Free State of Alta California.” In 1840, Vallejo assisted his nephew, now the new civil governor, in the round up of suspected American and British conspirators of a plot to overthrow the new governor. The seeds of discontent were thus sown between foreigners and the Californian government. In 1841, Vallejo attempted to purchase all of the Russian possessions in northern California: Fort Ross, the port of Bodega, and much intervening farmland with its livestock. The purchase was blocked by Governor Alvarado who had become suspicious of Vallejo’s growing power and influence. Alvarado allowed John Sutter’s purchase of land near the junction of the American and Sacramento Rivers as well as the purchase the Russian lands that Vallejo had sought. In spite of his role in the 1840 affair, Commandant General Vallejo was not opposed to American immigration. He welcomed the first overland American immigrants, the Bidwell-Bartleson party of 1841. He offered these immigrants passports, contrary to the recent strict Mexican immigration laws. At the same time, he cautiously requested more troops from Mexico to protect California’s defensive needs, and in 1842 appealed to Mexico to send a new Governor. Mexico responded by sending Manuel Micheltorena together with an unruly mob of 300 troops. To supplement his empty cash reserves, Governor Micheltorena sold to General Vallejo 80,000 acres, the Suscol Rancho, on the Carquinez Straits, and another 40,000 acres in the Petaluma Valley. An armed conflict approached with former Governor Alvarado and General Jose Castro bitterly resentful of Governor Micheltorena and his troops. General Vallejo did his best to avoid becoming embroiled in this conflict. Just a few days after agreeing to support Micheltorena on the condition that he send his unpopular Mexican troops back to Mexico, General Vallejo dismissed all of his own soldiers in Sonoma. Although Vallejo wrote Micheltorena that he was too poor to support his garrison, evidence suggests that he was indeed one of the wealthiest men in California with substantial income from the sale of wheat, hides, tallow, beaver pelts, wine, and produce from his enormous properties that extended from Mendocino to the Carquinez Straits. Micheltorena received assistance from John Sutter and from many recent American settlers in return for giving Sutter the authority to grant lands to foreigners in the Sacramento Valley. However, without direct support from General Vallejo and faced with declining approval from the Americans, Micheltorena was soon forced to return to Mexico. A Californio from Los Angeles, Pio Pico, was chosen as the new Governor, and a period of relative unity returned to California. With the arrival of close to 200 immigrants, and the party of 60 topographical engineers lead by Colonel John C. Fremont in late 1845, mutual suspicion increased between the Californios and the American settlers. In early March 1846, Col. Fremont raised an American flag near the Mission of San Juan Bautista, greatly offending General Castro who promptly ordered him out of California. When General Vallejo heard of this incident, he had no choice as a Californio official but to heap criticism on Fremont’s actions. This response, in turn, offended most American settlers. Both Fremont’s defiance and Vallejo’s response increased a rebellious stance among the settlers. But still more important were the threats that were issued by General Castro, now the new commandant general. Castro stated that he would block the entry of more Americans into northern California and forbid the sale of land to unnaturalized foreigners. He simultaneously ordered the recent American settlers to leave California without their livestock or possessions on pain of death. Yet just a few weeks later, General Vallejo spoke out strongly at a council in Monterey in favor of annexation by the United States as the best option for California. The council fully recognized their own military weakness, that support from Mexico was very unlikely, and that their land was coveted by foreign nations. Yet they were not agreed on the best course of action. A NEW ALLEGIANCE: On June 5, 1846, General Jose Castro visited General Vallejo in Sonoma and requested horses and arms to be used against Governor Pico with whom a power struggle was developing, or against Col. Fremont and his allies if this should become necessary. Vallejo agreed to supply 170 horses from his Soscol Rancho. As these horses were being herded to the south, one of Castro’s officers boasted to an American that the horses would be used to expel the settlers. This news spread rapidly and greatly alarmed the Americans who immediately organized men under Ezekiel Merritt to intercept these horses and then capture the arms and leaders in Sonoma. Arriving in Sonoma at dawn on June 14, Vallejo was informed that the goal of the men, now known as the Bears, was the establishment of an independent democratic republic, and that as he was a man of great influence with a supply of government arms, it would be necessary to surrender the arms and become their prisoner. After a lengthy discussion, articles of capitulation were drawn up by Dr. Robert Semple, the best educated man among the Bears, and Jacob Leese, Vallejo’s brother-in-law and a former alcalde of Sonoma. As lawlessness threatened, it was decided to transport Vallejo and three others to Captain Fremont on the Sacramento River for their safekeeping. Along the ride to Fremont, a group of Californios organized by Vallejo’s captain of the militia Cayetano Juarez, secretly offered to rescue General Vallejo but he declined this proposal, thereby protecting the lives of his family as well as his captors. Upon arrival at Captain Fremont’s camp, General Vallejo attempted to officially surrender, but Captain Fremont denied he had any connection to the Bear Flaggers who had taken him prisoner, and then, without explanation, had General Vallejo imprisoned against his will in Sutter’s Fort. Meanwhile the Bear Flag was raised over Sonoma, other settlers took up arms throughout California, and both General Castro and Governor Pio Pico fled to Mexico. By the time General Vallejo was released from Sutter’s Fort and returned to Sonoma in early August, the American flag had replaced the Bear Flag. Soon thereafter, word finally arrived that President Polk had declared a war on Mexico months earlier. Vallejo expressed to the former American Consul, Thomas Larkin, that he was content to be out of politics and able to devote himself fulltime to his family and his lands. However, Larkin was anxious to see that General Vallejo play an active role in the legislative council that Commodore Stockton was attempting to set up. This council never met because of renewed hostilities beginning in southern California which took several months to reconcile. Throughout this new conflict, which spread to the north, General Vallejo maintained neutrality. General Kearney appointed him sub-Indian agent for the Sonoma district. In late 1846, General Vallejo granted Robert Semple 5 square miles on the Carquinez Straits to build a city, Benicia, named after the General's wife. Vallejo maintained great interest in this endeavor which he had conceived of 11 years previously. Vallejo and Semple agreed to establish a fund to build a school from the profits of a ferry which Dr. Semple would run. In 1847, Vallejo transferred his own interest in Benicia to Thomas Larkin. As the gold rush commenced, these three men were among the very few content to stay clear of the gold fields. In 1848, Vallejo and John Frisbie, a recent arrival of 1847, opened stores to serve the miners, first in Sonoma, then in Napa, and still later in Benicia. CREATING A STATE: A crisis of lawlessness accompanied the gold rush, causing many Californios and Americans alike to realize that a government to establish and enforce civil laws was more essential than ever. In early 1849, Vallejo, Semple, and a few others met in Sonoma to establish a legislative council in northern California. General Vallejo was elected to this council. Military Governor Bennett Riley responded by calling for the California-wide election of delegates to a constitutional convention in Monterey. Both Vallejo and Semple were chosen from the Sonoma district. Semple became the President of this convention while Vallejo served on finance, elections, and translation committees. Vallejo supported the successful proposal to outlaw slavery in California as well as the Californio proposal to maintain separate property rights for women. He also supported the right of Indians who owned property to vote, a proposal which did not pass. Realizing that lack of money would prevent commissioners from drawing up a framework for a new legal system in the months ahead, he offered to pay for this himself. His offer was not accepted. Appropriately the convention ended when Vallejo, Semple, and Sutter were selected to present the new constitution to General Riley for his consent. On November 13, 1849, the California voters approved the constitution of California and General Vallejo was voted one of the first state senators. On September 9, 1850 Congress finally accepted the constitution and California was admitted as the 31st state, thereby completing the objective Vallejo had worked so hard to achieve. While state senator, Vallejo promoted an act for the government of the Indians, a tax to allow a free school system in California, and spoke out against a proposed act to exclude free blacks from immigrating to the state. 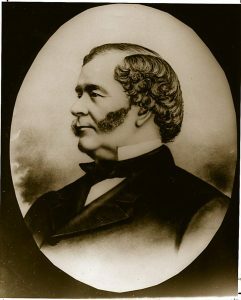 He pledged money to build a university in San Jose, the first state capitol. In 1851, Vallejo donated land 7 miles west of Benicia on which to build a new state capitol. He also offered $370,000 in cash for public buildings, including a university. The voters approved this offer. The city was to be called Vallejo in spite of the General’s suggestion of the name Eureka for this site. In 1852, the capitol was moved to the embryonic city of Vallejo but did not stay because construction was far from complete. After a brief move to Sacramento, the capitol moved back to Vallejo, but now Thomas Larkin lured the legislators to Benicia. General Vallejo had already spent $100,000 of his own money on the new town, and was on the same downward financial slope as John Sutter, Robert Semple, and most of the other early residents of California who were too trusting of the American system to protect them from the boundless greed of new immigrants. The new United States Land Commission put the onus on each land grant owner to prove the validity of each grant to avoid forfeiting it. The resulting trials as well as financial mismanagement by a son-in-law of the General, John Frisbie, who had obtained General Vallejo’s power of attorney and was earning substantial fees, were responsible for the loss of nearly all of the General’s land. Yet through these ordeals Vallejo showed an enormous power of forgiveness and continued to find virtues in others. Frisbie became richer as Vallejo became poorer. By the mid-1860’s Vallejo’s income derived chiefly from wine production, the leasing of small plots of land for truck gardening, and from operation of the Sonoma Water Works on his one remaining property, Lachryma Montis, in Sonoma. He became a member of the state board of horticulture, and supported an early resolution to protect the redwood trees. He collected a vast amount of written material pertaining to the Indians and early Californios which he provided to Hubert H. Bancroft, and together with his 5 volume written history remains a preeminent resource for historical research at the Bancroft Library today. General Vallejo maintained an unshakable faith in the American democracy, and took great pleasure in an 1865 visit to the historical sites of Boston, Philadelphia, and Washington, where the founding fathers had created this system. He became a ubiquitous orator and guest at public events and joined the Society of California Pioneers. He proudly supported his children in the new California of the late 19th century which barely retained any trace of the California he had known in his youth. He died on January 18, 1890 at the age of 82 and was buried in the Sonoma Mountain Cemetery. His passing was recognized as the end of an era that encompassed the most historic events in California's past. Throughout the 20th century and to the present, General Vallejo's many contributions to the City of Sonoma were remembered in various civic events and parades, often with a citizen portraying the General for the event. On Pueblo Day, June 24, 2017, the 182nd anniversary of the founding of the Pueblo de Sonoma, General Vallejo was honored by the dedication of a life-sized bronze statue of him on the north side of the historic Sonoma Plaza. Bancroft, Hubert. H. (1964). California Pioneer Register and Index 1542 – 1848. (extracted from The History of California by H. H. Bancroft). Regional Publishing Co., Baltimore, MD. Browne, J. R. (1850). Report of the debates in the Convention of California on the formation of the state constitution, in September and October, 1849. J. T. Towers, Washington, D.C.
Davis, William H. (1889). Sixty Years in California – A History of Events and Life in California. A. J. Leary, Publisher, San Francisco, CA. Emparan, Madie B. (1968). The Vallejos of California. The Gleeson Library Associates, University of San Francisco, San Francisco, CA. Ferrier, W. W. (1937). Ninety Years of Education in California 1846 – 1936. West Coast Printing Co., Oakland, CA. Hansen, Joseph A. (1960). The Search for Authority in California. Biobooks, Oakland, CA. Leese, Jacob P. (1878). Papers on the Bear Flag – presented to the Bancroft Library 1878 (unedited photocopies of assorted letters and documents). McKittrick, Myrtle, M. (1944). Vallejo – Son of California. Binfords and Mort, Portland, OR. Parmelee, Robert D. (1972). Pioneer Sonoma. The Sonoma Index-Tribune, Sonoma, CA. Rosenus, Alan (1995). General Vallejo and the Advent of the Americans. Heyday Books/Union Press, Berkeley, CA. Vallejo, Platon M. G. (1994). Memoirs of the Vallejos. Reprinted from the San Francisco Bulletin, January 26, 1914 to February 17, 1914 by James D. Stevenson, Publisher, Napa Historical Society, Fairfield, CA.